For decades, the rural Vermont town of Hardwick (pop: 3,200) grappled with a challenged economy. Like so many small towns, the once-thriving regional industry had died, and the majority of the working population was forced to commute far beyond the town line to find work. Enter the “agripreneurs,” a group of ambitious young agricultural entrepreneurs with big ideas about how regionalized food-based enterprise can be used to create sustainable economic development and wean our nation of its unhealthy dependence on industrial food. On a sun-washed Vermont hillside on a late July afternoon, my face tilted into the day’s fading heat, I stood and listened to Tom Stearns as he expounded on the woes of modern agriculture. “Who’s the biggest user of energy? Agriculture! Who’s the biggest user of land? Agriculture! Who’s the biggest user of water? Agriculture! Who’s the biggest polluter? Agriculture!” He stabbed a finger in the air for emphasis. “All we have are models of broken plans to look at. Totally, completely broken.” He sipped from his beer, and turned to face me squarely. “In five years, we will have people from all over the planet visiting Hardwick to see what a healthy food system looks like.”Tom and I were standing on the sprawling hillside lawn of Heartbeet Life Sharing, a residential farming community for special needs adults, who participate in all aspects of farm operations on the sloping 160-acres of field and forest. There was drumming and a bonfire and small children running across the sunlit lawn clutching rabbits to their chests. A small herd of cows grazed on pasture below the house, casting long shadows in the late afternoon light. Earlier in the day, there’d been a collective effort to construct a wood-fired stone-and-clay oven and now it sat drying, at once lumpen and graceful. If one were looking for an inspiring setting in which to discuss localized agriculture, with all its ancillary benefits of social good and pastoral beauty, one couldn’t have imagined a better stage. Over the past months and years, there’s been a lot of these sort of discussions in Hardwick. And lately, Tom Stearns, the owner of an organic seed company called High Mowing Seeds, had found himself thrust (or was he thrusting himself?) into the spotlight with increasing frequency before audiences that seemed to only grow in size. He talked about America’s industrial food system, how it had become frayed and vulnerable, how it sucked the sweet life out of our nation’s towns and cities and out of the bodies and minds of the people who lived in these communities. He talked about the dangers of our dependence on this system, on the urgent need to wean ourselves from its power, to develop an antidote to its multitudinous ills. He spoke of the social good that would arise from this seismic shift in how we feed ourselves. But mostly, he talked about this little town that was embarking on an ambitious quest to define itself as the community that would show the rest of America what a healthy, functioning and, ok, maybe even sustainable food system might look like and how other communities, towns, and even cities, will learn from Hardwick. And on that halcyon summer afternoon at Heartbeet Lifesharing, standing in what felt like the soft center of a lush, fertile greenness that permeated everything, I listened as he unfolded his vision and I believed it because I could see it all laid out before me: The cows nuzzling for tufts of ripe grass, the wholesome-looking neighbors gathered to share wholesome-looking dishes (I regretted my decision to eat earlier with my family, who’d stayed home) that were surely comprised of local ingredients, the emotionally and behaviorally-challenged men and women who were finding meaning and purpose in this agrarian landscape and the day-in, day-out demands of running a farm. There was nothing to argue, here. There was only health and bounty and promise. This was what a food system should look like. Of course the world would take notice; of course people would come from all its corners to see this wonderful thing being created in this wonderful little town. Who could resist? I snapped myself out of my reverie. Stearns had dropped into a rare moment of silence, fiddling with the frilly elastic hair band around his neck (he has two young daughters, who were frolicking on the lawn below us). How? I asked. How do you create this thing? How do you break it down into little pieces, how do you address the hard questions of money and regulation and simple habits? How do you take this – I swept my arm across our view – and export it, scale it? How do you make it something that’s not just for foodies, for the affluent and aware? Stearns, in what I would come to recognize as his preferred oratory style, spoke in the flourished language of a politician running for office. “We can export a lot of things, but I think our main gift will be inspiration.” He flared his nostrils and adjusted the hair band. “We’re going to be exporting a lot of inspiration.” It sounded nice, though it wasn’t a terribly satisfying answer. But by then, I’d finished my second beer, and someone had dropped a pie onto the picnic table. The drums were beating a nice groove and I felt my hips moving. I wasn’t in the mood to press the issue. Tom Stearns and I strolled across the grass toward the pie. 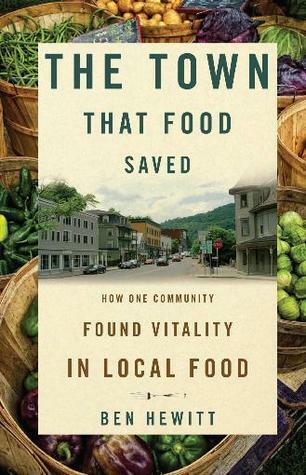 If you’re interested in purchasing The Town That Food Saved, please consider supporting your local independent bookseller and your local economy. If mailorder works best for you, you can order from the Galaxy Bookshop in Hardwick, Vermont and support my local economy!